Although I posted an “N” post yesterday, I had done so much research on Nelson Cantrell that I decided to write it up as the Other “N”. Nelson Cantrell is listed on the same Declaration as Major Edmundson who we met earlier. He testified that he knew Thomas was who he claimed to be. He was literate and signed his name on the document below. Nelson Cantrell was born about 1873 in Sumner County Tennessee, the second of the eleven children of Reuben Moore Cantrell and Sarah “Sallie” Lawrence Cantrell. Reuben Moore and Sallie Lawrence were married in 1867. In the 1880 census, the family was going by the surname of “Moore”. The father, Rueben did farm labor. The mother, Sallie kept house. Neither could read or write. The two oldest children, Eight year old Mary and seven year old Nelson attended school. The three younger children (ages five, three and one) were too young for school. By 1895 the family begins to appear in the Indianapolis City Directory. Sarah is listed as the widow of Reuben. They are now using the last name “Cantrell”. Perhaps they, like Thomas Ray Allen, decided to use a different name because they no longer wanted to use the name of the former slave owner. This was not an uncommon practice and makes it confusing to track family members unless you realize there was a name change. I suspected there had been a name change because I could not find the family before 1880. When I found a marriage record for Sallie with her same last name and a Reuben in the same area that they were originally from, I was hopeful that I had found them. Then I found the couple in 1880 with children of the same name as they appear later. This caused a bit of joy on my part. Nelson first appears in 1895 as a hostler in Indianapolis. Two years later he and Julia Buckner were married. They shared a home with her family for several years. First her father was listed as head. Eventually Nelson was listed as head. Nelson continued to work as a hostler, a laborer and later as a trucker. 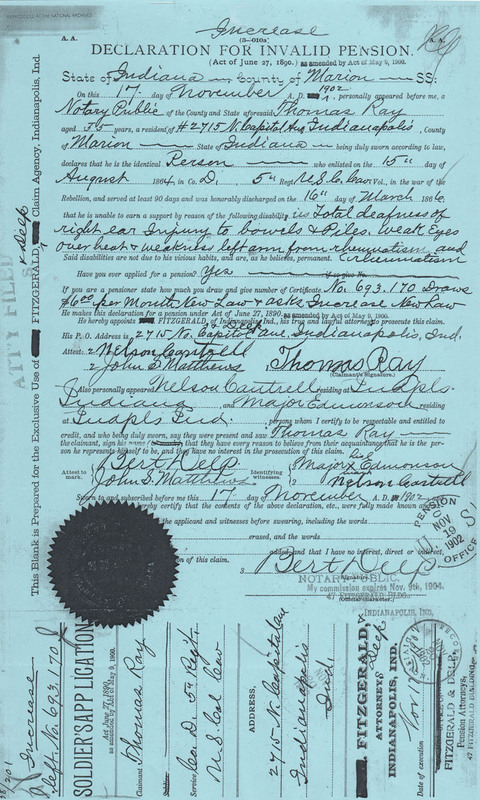 On his World War 1 draft registration card, Nelson was described as being tall and stout with black hair and brown eyes. On February 23, 1930, Julia’s father, Robert Buckner died at the shared home. In May of the same year, Nelson’s wife Julia died of diabetes with lobar pneumonia as a contributing factor. Nelson married again sometime before his death at 62 on February 7, 1940. His wife, Rosie, was 31. The cause of death was pneumonia with emphysema as a contributing factor. A neat way to deal with a problem letter in A-Z and to maintain the Thomas Allen connection. With each new post I am amazed anew by how Thomas Allen’s name change generated so much documentary (and personal) support from friends, neighbors, family and fellow veterans — with Nelson being just the latest example. Wonderful research! Military pension records have a wealth of genealogical information. They sure do and I’m so glad I finally found an ancestor who had one! I love seeing these old documents. It’s great that he was able to read and write. I imagine it must have been very difficult not being able to, even in a time when many people couldn’t. It’s been said before, but the amount of research you’ve conducted is pretty impressive. I like how you were able to continue with the “other” N — I will likely have to be creative in some of these upcoming posts, as well. Great work! It isn’t clear to me how Nelson knew Ray. He gives a wealth of information though about Ray’s physical condition: deafness in right ear, injury to bowels, piles, … I can’t read the last word beginning with c.
I also looked at the printed form and saw the war was called the “war of rebellion” which I found interesting. My knowledge of the war largely formed by “Gone with the Wind”, both film and book, plus “Little Women” by Louisa May Alcott. I find wars madness and they make such little sense retrospectively. So many people killed and injured because a few men, it is men, could not sort issues out with debate and reason. From reading the file, it seems Thomas complained and shared his symptoms with everyone he knew. I know that Thomas also worked as a hostler, so perhaps they worked together. I was thinking I need to map where everybody lived. They probable lived in the same community because Indianapolis was very segregated.